Compared to a continuous one-hour nebulizer, pediatric asthmatics realized shorter treatment times, faster relief of symptoms and nearly 45 minutes reduced emergency department length of stay with the advanced breath-enhanced nebulizer. NebuTech offers the comfort of less time receiving therapy, faster relief of symptoms and a shorter stay in the ED for a child with asthma. Data presented at the Pediatric Academic Societies (PAS) 2016 annual meeting by Matthew Wilkinson, M.D. (Dell Children’s Medical Center, Austin, TX) concluded that the breath-enhanced jet nebulizer NebuTech® HDN from Salter Labs reduced emergency department length of stay (ED LOS) by 44 minutes (p-value <0.001) compared to a continuous nebulizer treatment in children with moderate to severe asthma exacerbations. Matthew Wilkinson stated "Our long term research goals relate to improving the efficiency and effectiveness of acute asthma care for children in the emergency department (ED). Nebulizer technological advances have allowed us to test some theories with regard to the optimal delivery of beta agonists to sick children in the ED. The results of this trial suggest that using these newer technologies may allow us to more quickly and efficiently disposition our sickest asthmatics. We are very excited to conduct future trials to further test this hypothesis." 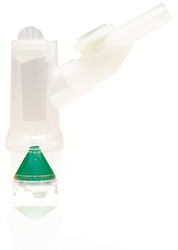 The NebuTech nebulizer was chosen for the study because of its breath-enhanced design that delivers a large bolus of medication to patients early in the inspiratory phase, and its rapid treatment time. These study results add to the strong body of evidence on the outcome benefits of NebuTech nebulizer for pediatric asthma and COPD patients. The randomized, controlled study compared a Standard Pathway, where pediatric asthma patients received 1-hour long continuous albuterol treatments, to a Rapid Pathway of back to back 5-minute albuterol treatments with the Salter NebuTech nebulizer. The faster NebuTech treatments times allowed for shorter time between reassessments, quick action upon symptom resolution, and resulted in a statistically significant reduction in ED LOS with similar patient safety. In this study, ED LOS was defined from the time the patient was entered into study, until disposition decision. “A pediatric asthma exacerbation and ED visit is stressful for both the child and the parent. NebuTech offers the comfort of less time receiving therapy, faster relief of symptoms and a shorter stay in the ED for an asthmatic child. These not only have a positive impact on the patient quality of care, but also can improve ED work flow efficiency and reduce medical costs,” commented Lorelee Goehle, RRT and Salter Labs Clinical Director. “Hundreds of hospitals are switching to NebuTech every year, making it the fastest-growing jet nebulizer in the United States. An important driver of this is the versatility of NebuTech to be used with COPD patients and asthmatics at the hospital and the continuum of care our reusable NebuTech provides to these patients at home,” shared Jane Kiernan, Salter Labs Chief Executive Officer. Salter Labs is a leading global manufacturer of single-use medical devices for respiratory and anesthesia care use in hospitals and homes. The company is known for delivering comfort and performance for patients and clinicians. Current leading products in include 1600-series oxygen cannulas for home oxygen delivery, capnography cannulas for monitoring during sedation, and NebuTech high-density nebulizers for delivering aerosol medication. The company is building a new future and expanding its range of products focusing on superior patient care, reliable outcomes, and innovative new products for respiratory and anesthesia. Today, nearly 1,000 employees dedicate themselves to helping patients worldwide breathe freely.